This topic contains 4 replies, has 2 voices, and was last updated by punicatheme 3 years ago. How do i quickly fix this please? the website is http://www.onlineearningacademy.com please take a look and tell me the solution for this i have the same theme on another website which has a lot of visitors a days and thats looking really bad with this problem. Firstly, I’m so sorry for the late answer, but if you create consecutive replies, your answer will mark as resolved and I can’t get the exact status of this topic via our notification system. 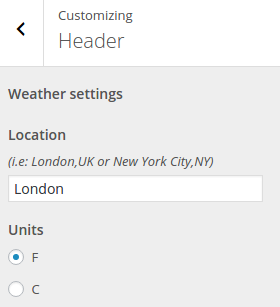 Have you added an OpenWeatherMap API Key? Also try to switch between F or C for available data. The topic ‘Weather widget problem’ is closed to new replies.